For those who follow Actual Play Stream giant Critical Role, the opening of Episode 44 in Campaign 2 is reason for major squee. 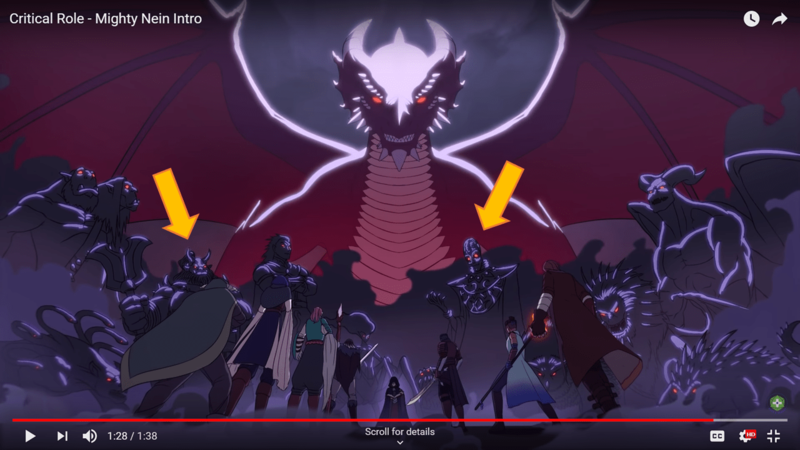 For those who don’t, please forgive this moment of fangirling over Dungeons & Dragons, and the fact that a web series with more than 135,000 viewers have now been given a retro-Saturday Morning Cartoon intro, drawn and animated by local artists Kamille and Kevin Areopagita. Kamille, who is @karekareo on Twitter, and her brother Kevin are no strangers to creating art for Critical Role and their affiliates. Last May, they showcased their amazing art style and animation in a D&D Beyond commercial. Yesterday, Critical Role rolled out new opening credits to replace the 80s-themed one that opened the 2nd campaign. This new intro, helmed by cast members Travis Willingham and Sam Riegel, features the Areopagita siblings’ art and animation. The intro song is performed by cast members Ashley Johnson of TV show Blindspot fame, and Laura Bailey, the voice of Jaina Proudmoore in World of Warcraft. But the best thing about the work of the Areopagita siblings are their easter eggs! Spoilers for Critical Role from here! Look away if you don’t want to be spoiled!! 1. The intro starts with animations of Fjord and Beauregard’s back stories. Note the chanting in this section — it’s the deep basses of Travis Willingham and Sam Riegel’s going “Roll, roll, critical, critical”. 2. The Traveller’s hand appears after Jester’s deity booped her nose with the chalk? Crayon? Also, hello, Ruby of the Sea! 3. 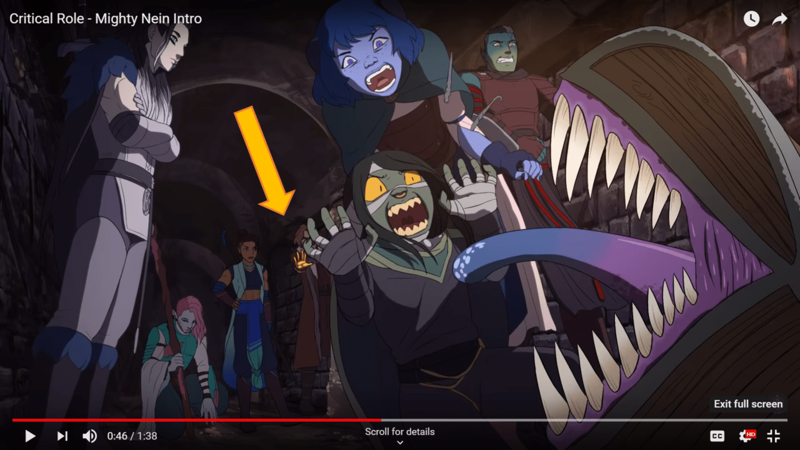 In the scene where Caduceus’ hat flew off, Beau sits next to Caleb with a hand on his shoulder; as she does when the wizard is scouting through his familiar (note the blanked out eyes!). No cat!Frumpkin here though — the fae creature takes the form of a hawk flying ahead of the cart in the next sequence. 4. BEST. REACTIONS. EVER. to Nott trying to check for traps and a Mimic chest revealing its fangs. 5. A quiet time in the woods as Caduceus heals a graceless Beau. Finally, the Mighty Nein gets a cleric who actually likes healing. 6. Fjord bookends his fluid fight against merrows in the Labenda Swamp with a Blink spell. 7. Not sure if Caduceus is at a level that would allow for Turn Undead to explode. But if he is, of course he’s turning the undead into mushroom tea. Kamille said on Twitter that this scene was mostly done by her brother Kevin. 8. Remembering fallen friends. Mollymauk’s cloak was unexpected. Loved that there was a raven flying over his grave. Vax would approve. This part KILLED me. KILLED. ME. 9. And here’s another shot of Caduceus healing Beau. Every party needs a chill bro who gives you dead people tea. 10. The characters in the DM’s book — NPCs and guest players: The Gentleman, Caliana, Shakaste and Kiri, PUMAT! Nila and Keg. The Ruby of The Sea. Orly the Tortle and Ivantika. Respectfully, all firbolgs know each other. BONUS! Lorenzo makes a cameo! Also, is that Vecna??? While #PinoyPride is not a thing, there’s still that warm feeling in our tummies to see local artists recognized on a platform such as Critical Role. That warm feeling intensifies at the thought of fellow fans working in an official capacity for the fandom that you love. It is inspiring and it does encourage fans for their turn to roll. If you want to support Kami and her brother, you can donate to their Patreon. For more information on Critical Role and where to watch, check out Geek and Sundry over here!